Loving Sai Ram and greetings from Prashanti Nilayam ! The eightieth Birthday of Swami is fast approaching, and we in the Studio are very busy with all sorts of projects aiming to bring Swami’s Love and Message to devotees everywhere. This has given me a lot of opportunity to reflect deeply on many aspects of Bhagavan’s Mission, and today I would like to share with you some of those perspectives. During the last four decades, Swami has launched many projects dealing with healthcare, drinking water supply, and of course education. In this talk, I shall confine myself to education, reserving the other missions to later talks perhaps. Where higher education is concerned, Swami first founded the College for Women in Anantapur. Following that came the College for men in Brindavan, and after that the College in Puttaparthi. Finally, in 1981, the three Colleges were neatly blended into a University, the Sri Sathya Sai Institute of Higher Learning. Old timers would take great delight in telling stories about how, many years prior to this, Swami talked of a University in Puttaparthi, how even devotees supposedly close to Swami and who missed no opportunity to hail Him as the Omnipresent and Omnipotent Lord, shook their heads in disbelief, and so on. Others would prefer to wax eloquent on the free education that is a distinctive feature of Swami’s University. In short, there are many points of view concerning Swami’s Schools and Colleges. All these points of view are no doubt valid but I would like to go somewhat deeper. To understand better Swami’s Mission in the area of education, I believe we must go back thousands of years to the time when India was steeped in the Vedic tradition. The pursuit of knowledge was then a serious matter, and the Guru who in his ashram collected disciples and groomed them, considered the sustenance and the propagation of the Vedas as his prime duty and a sacred mission. The disciples and the Guru lived together, and instruction was continuous, not being restricted to the formal sessions alone. Living with the Guru was true education in those days. In every respect, the Guru was God’s proxy in human form. The Guru did not expect any payment, and accepted with humility what was offered to him by students and patrons. Knowledge was not only freely shared but it was the duty of those who possessed spiritual knowledge to pass it on to as many people as possible. What I have here tried to do here is to give a brief portrait of a school of the Vedic age. This school was called Gurukulam. However, to understand its full significance, one must place the Guru and his Gurukulam against the backdrop of Vedic Society. I shall attempt that shortly. Boys were accepted as disciples in the Gurukulam at the tender age of five, after they had gone through the ceremony of Upanayanam. They then spent many years with the Guru, and typically they would leave when they attained the age eighteen or so. Once out of the Gurukulam and in the world, the graduate, shall I say, would get married and settle down to lead the life of an ideal householder, as enjoined in the scriptures. At this point, I must bring in the structure of Vedic Society. This was organised into strata, often referred to as the Varna System. In the Gita, Krishna declares that it is He who created the Varna System. In later years, the Varna System came to be known as the Caste System, and thanks to the many evils that contaminated the Caste System, it earned a very bad name. In fact, many social and political activists of today have a dim view of Lord Krishna because, according to these critics, it was Krishna who started all the trouble. It is useful to spend a few minutes checking out all this. First of all, what exactly is the Varna System, and what precisely did Krishna mean when He said that He is the one who created the Varna System? My view is this. The Varna System merely says that people are born with different aptitudes. This is another way of saying that there is diversity in human nature. Thus, according to me, Krishna was merely saying that all diversity in Cosmos, including in human beings, originated from Him. What’s wrong with that? I mean let us take a country like, say, Germany. They have no caste system there, right? And yet in this very same Germany, some people have a passion for sports, some are dedicated to music, some just love business, some are deep into science and so on, right? How come? All this happens because different people have different aptitudes and tendencies; and this is simply a reflection of the diversity of human nature. Seen in this manner, the Varna System is a mere formal codification of the stratification of human nature that already exists. Today, in practically every country there are intellectuals, captains of industry, artists, scientists, men of the armed forces, and so on. People do different things based on their natural instincts and inclinations. This reflects nothing but the stratification of that particular country. Nobody says it is wrong, unethical, or immoral to have such stratification. This kind of natural stratification existed even in the Communist countries, and the Communists took it in their stride. So let us be clear about this. Different people have different aptitudes and that is quite natural. Such stratification always existed and always will. Nobody can condemn or criticise this. I know some of you who are listening might jump and say: “But hey, wait a minute. You are distorting everything! You have got it all wrong!” I know exactly what your objections are going to be; please be patient and I myself shall bring them up. OK, what is going to be the first objection? It would be that the Varna System institutionalised stratification, that the son of a Brahmin was a Brahmin while the son of Sudra was a Sudra. Agreed. But you know what? If you go back say a thousand years, in all societies, activities that people pursued were largely hereditary. A hunter’s son would be a hunter, a farmer’s son would be a farmer and so on. By the way, have you noticed how many English names are associated with trades like, Goldsmith, Baker, Ironmonger, Carpenter, and so on? So you see, if in Vedic times a Brahmin’s son was a Brahmin, a Vaisya’s son was a Vaisya and so on, it was in keeping with what was common in those times in all societies; nothing wrong in that. You might at this point argue: “We are not complaining about the hereditary business but the stigma attached to the lower castes in the Varna System and the indignity and humiliation the lower castes had to suffer.” I must admit that you have a point there. You know something? When I was young, my friends and I were all hopping mad about the injustices of the Caste System as it was then being practiced. If you recall, even Gandhi fought against the evils of the system. Talking of Gandhi, I must bring up one important point here. After I entered service, I was too preoccupied with Science to bother about the Caste System and all that. I began to think about it seriously only after coming here. I found to my surprise that Swami supported the Varna System. I tried to read everything Swami had said on the subject – and believe me He has indeed made many comments. I recall that on one occasion, He explained the system in great detail to Hislop. In spite of all this, I had many doubts. That was when I turned to Gandhi. It so happens that I have a book entitled The Gita According to Gandhi. This book is by Mahadeva Desai, a close associate of Gandhi, and is essentially an English translation of a book that Gandhi had written earlier in Gujarathi. In that book, Gandhi comments extensively on the Varna System and the Caste System. Interestingly, Gandhi praises the Varna System and sharply condemns the Caste System. But are not the too the same? Not quite; what we had to start with was the Varna System; what it later became was the degenerated Caste System. Thus it is that Gandhi supported the Varna System but opposed strongly the Caste System. You think there is a contradiction? Let us examine. You see, Varna System was born when the Scriptures formalised natural stratification by declaring that Society would be divided into four castes composed of the Brahmins, the Kshatriyas, the Vysyas, and the Sudras. Further, people born to Brahmins would be Brahmins, people born to Kshatriyas would be Kshatriyas, and so on. The duties of each community were also specified. Thus, Brahmins would be models of humility, concerned mainly with the preservation of the Vedas and guiding people on how to lead their lives in accordance with what the Scriptures say. The Kshatriyas would defend the kingdom, the Vysyas would be concerned with trade and commerce, while the Sudras would take care of what today we might perhaps call the service sector. This was how it was when the System got started; all nice and smooth, and everything hunky dory as they would say in America. But systems have a way of getting corrupted and atrophied if one is not careful and that precisely is what happened to the Varna System. People in the so-called upper castes started becoming selfish and greedy and began to exploit those below, especially the Sudras. That is when the entire System went haywire and remained so for centuries if not thousands of years. It is this aberration that Gandhi fought against tooth and nail, and NOT the original System. On the contrary, since Krishna had said it was He who had ordained the Varna System, Gandhi went out of the way to defend it! Some of you might wonder. I was supposed to say something about Swami’s educational program and here I am talking about the Vedic age and all that. What has the Vedic age got to do with Swami’s University? Everything, and that exactly is what I am coming to. Earlier, I described what the members of the different Varnas were supposed to do. There was something else that I should have mentioned but did not; I shall make up for it now, especially since it is a very important point. In the Vedic age, every individual was supposed to act always for the benefit of Society. Selfishness was taboo, and everything was done in the name of God, and for God. This is an important point and needs some explanation. Let us take Brahmins. They were the custodians of Scriptural Knowledge. This Knowledge was always to be used for the benefit of Society. For example, Brahmins advised Kings on how to rule and Kings accepted their advice with humility. The service to Kings was rendered as a duty and not for any payment or reward. The Kshatriyas likewise defended Dharma because it was their duty to do so. In fact, if you remember, that is exactly what Krishna tells Arjuna, namely that it is his duty to fight to protect Dharma, and not quit giving lame excuses. The long and short of it, when everyone worked for Society and scrupulously observed Dharma, there was really no problem. Nobody looked down upon anybody and there was no exploitation either. Problems appeared only when people started to become selfish and self-centred. Just to illustrate my point, imagine how different life would be if there were no patents especially on life-saving drugs. Knowledge is God’s gift and we have no right to appropriate it and a make business out of it. We now come to the central point about stability in Society. The question is: How to maintain stability in Society when there is stratification? Will there not be exploitation? My answer is as follows: There will be no exploitation when individuals believe that they are the Trustees of the Lord and discharge their duties accordingly. This in fact is the key point, that of Trusteeship. Each one of us is blessed by the Lord with unique gifts; that is why we are all different, and that is why there is a natural stratification. One person may be rich; his wealth is a gift of God, and he is supposed to handle that wealth as a Trustee of God. Another person may be very intelligent; that person is supposed to use his intelligence as a Trustee of God. And so on. If every one acts this way, stratification cannot lead to social problems. Let me now bring all this together so that you do not get the impression that I have strayed away from what I promised to speak about. I started with the Gurukulam and how the Guru carefully nursed the disciples so that they would not only sustain the Vedas but spread its message. 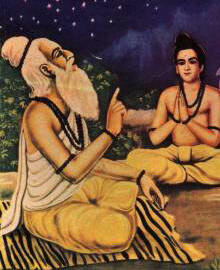 Next, I pointed out that deriving from the Vedas, a formal Varna System was established in Society. There were four strata, and while their roles might have varied, there was nothing inferior or superior about any particular caste; that aberration crept in later. The Varna System was based on heredity. This did not per se make any member of any caste a dis-advantaged person. That was because every person belonging to every caste acted as a Trustee of God. At this point, let me clarify once again what the Trusteeship concept implies. According to this, no individual owns anything, and everything belongs to God. Let us say there is a surgeon who has acquired high skills. He may feel he has slogged and become what he has. However, the truth of the matter is that God has given that surgeon all the opportunities; otherwise, he would not be where he or she is. Seen in this light, the knowledge and the skill that surgeon possesses are really a small part of God’s treasure, given to this particular person to manage and look after. And how does this person do that? By using that knowledge and person solely in God’s service. Of course when the surgeon serves Society, it means that he or she is actually serving God, since, as Swami has often told us, Society itself is God. It is this kind of training wherein one regards everything as belonging to God and dedicates one’s life to God’s service that the Guru of old really imparted. By the way, those of you who have read Kasturi’s wonderful book LOVING GOD would remember that when he was born, his parents took the baby to the local Siva temple, placed the child there before the idol of the Lord and prayed: “O Lord, you have entrusted us with the responsibility of bringing up Your child. Please bless us with the means to do so.” Thus, even children were supposed to belong to God, parents being mere caretakers. OK, but what has all this got to do with today’s world, Swami’s Institute, etc.? That is your question, right? Please bear with me for a few minutes and that would become clear. The first thing we must note is that Swami’s Institute is really a modern Gurukulam. I describe the Institute thus because it beautifully and seamlessly blends the best of old traditions with many of modern requirements. The style of living in the residential Hostels and discipline that the students follow is that of a Gurukulam, but the subjects studied by students are mostly modern. Let me amplify. According to the Vedas, man is a combination of the body, the Mind and the Atma. Swami has told this many, many times. So, strictly speaking, all three components of the human being must receive proper nourishment and that exactly is what Swami’s Colleges provide, in balanced proportion and in a disciplined manner. The day begins with Suprabhatham, then there is jogging etc., after which students have a bath, eat breakfast and go to College. In the College, the day always begins with prayer. After this the classes, where maths, physics, chemistry, biology, computer science, etc., are taught. In the afternoon, all students assemble in the Mandir, where, in innumerable ways, often quite subtle, Swami grooms them. Discipline is the undercurrent of all activities, and in the Hostel, most support activities are managed by students themselves. They take care of the sick boys, run the Hostel Library, do all the welding etc., needed for the huge structures they put up at Sports time, stitch all the costumes needed for dramas, and so on. I was amazed at the sort of training they get in self-reliance; they do every thing from electrical repair, to plumbing. I don’t think students elsewhere ever get this kind of training. This again is reminiscent of the Gurukulam where the disciples played a key part in keeping it going. When the academic year begins, there is, in practically all Colleges in the country, a strange and barbaric initiation custom called ragging. This is supposedly a function during which the seniors get to know the juniors. 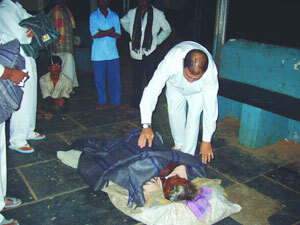 That is only on paper; in practice, ragging has not only become violent and obscene but also dangerous. In fact, many students have even died but strangely the authorities do not seem to bother. I have not seen any Vice Chancellor or Chairman of UGC raise a rumpus about this primitive custom, which is totally un-Indian and alien to our Culture. The only place where ragging is absent is Swami’s Colleges. In fact it has not even been heard of here. On the contrary, the academic year often begins in the most civilised manner possible, with a Summer Course on Indian Culture and Spirituality. I am sure you all have heard about the Summer Course. Life in the Hostel is Spartan. No individual rooms, and all students sleep on the floor. Living together breeds a strong brotherly feeling, and it is always share and care. It is not readily apparent but a careful examination would show that in many respects, Swami’s educational combines the best of the past and the present. Many misguided people think: “Oh, Swami’s boys may be goody, goody and all that but when it comes to real life, they are not at the top.” Let me tell you that during the recent GATE examination, that is taken by over a hundred thousand college students all over the country, our students not only had a high success rate but those who qualified came really at the top with one of them securing the All-India first rank. I hope that silences those who tend to have a dim opinion of our students. For those of who do not know, GATE stands for Graduate Aptitude Test for Engineering. This is a common entrance exam for students with Post Graduate degrees, who want to pursue higher studies and go for the doctorate degree in engineering sciences. I might also add that many of our students are doing very well as research scholars not only in elite Indian research establishments but also in graduate schools abroad. By the way, it is the unanimous opinion of all our old students who are studying for Ph.D etc., abroad, that their hostel training has stood them in good stead; they do not feel stress since they know how to space out. Disciplined life can make a hell of a lot of difference, I tell you. Just to place all this in context let me also draw attention to a news item that a friend in America sent me. It appears that the Harvard Medical School has done an extensive survey of students of universities in America and discovered that on the average, each student spend $5,500/- per year on alcohol. This is shocking and shows what damage the lack of discipline and self regulation can cause. Recently, newspapers in India went gaga about the achievements of business school graduates coming out of the so-called elite institutions. They went gaga because many so-called big companies were hiring these students at real fat salaries. One boy was being offered $ 150,000/- or so and many others were being offered salaries in the range 150,000 to 100,000 dollars per annum. And many of these jobs were in America. So the papers gushed: This is what brand names are all about. All this may sound great, and that exactly is what it is. You might wonder what’s wrong with that? Before I come to that, let me mention that the companies that offer such fat salaries also expect a tremendous lot and it won’t take them more than one minute to sack a person. I know a person in the US who held a high position in a prestigious company with a salary of about half a million dollars. The top management of that company changed and within one day this man was fired, just like that! Not that he did anything wrong; it was simply that the new management wanted its own crew in! Just imagine the stress that these young graduates would be subjected to. But more than that, I want to ask a fundamental question. Which is truly better? To be great or to be good? You do not have to search for the answer; Swami has given it. So-called greatness belongs to the external world while goodness belongs to the Inner world, the world of God. I do not want you to jump to the conclusion that our graduates are zeros in this world. Far from it. They may not hog the headlines but I do know how a good many top Corporate executives simply adore our students. Why? Because our boys are excellent team players, work hard, and are scrupulously honest. All this flow naturally from good character. Contrast this with what a senior teacher in a business school in America said after the recent rash of corporate scandals. He asked: “Whatever happened to old-fashioned ideas about truth and honesty?” Well, in the name of training managers to be aggressive and highly competitive, values just got thrown out, that’s all. Allow me to recall here an incident that took place in the summer of 1996 when a Summer Course was in progress in Brindavan. I was the Vice Chancellor then. One afternoon, the main drainage got blocked and gutter water was threatening to back flow into the Hostel kitchen. If that happened, we would have had a major disaster on our hands, because it was in this kitchen that food was being cooked for about two thousand people including the students. Many stood around the drain wondering what to do. There was no dearth of suggestions of course. One person said, “We cannot handle this. We must call the Sanitation Department.” On paper this might have been a good suggestion but in practice it was not. Firstly, the Department was in the city, and it would take hours for them even to register the complaint. Next, things never happen in a hurry in these departments, even if there is a crisis. That was when something totally unexpected happened. One of our students who was attending the Summer Course, a student of our business school, simply took off his shirt, shouted Sai Ram, and entered the manhole. Imagine that. This was real gutter and this boy entered it to fix the problem. He was almost neck deep in sewage. Feeling with his hands, he located the blockage. He grasped what was obstructing the flow and pulled hard. In a minute, the obstruction gave way and flow of sewage started immediately. I ask you: Would any of these toppers from the brand institutes about whom so much is being written ever do that? This reminds me of a nice story. It appears that an American tourist once went to Calcutta and there saw Mother Teresa drag a dying man from the gutter, cleaning him and all that. The tourist was shocked and exclaimed, “Gee I would not do that, even if I am given a million dollars.” Mother Teresa turned to the American, smiled and said “I would not too. In fact, I would not do it even if offered two million dollars.” The American was puzzled and said, “But you are doing it!” Mother had the last word. She said, “Ah, this I am doing for God.” That is perhaps a story but what I narrated is a real incident. Our student did it for Swami. Let me wrap up. There are so many wonderful things about Swami’s Institute. First of course is the free education that is unique. Next is the intense personal attention that Swami gives to the students. Then comes the way students shape up and lead their lives after they leave. A quick word here about Grama Seva. Do you know that many of the students taking their post-graduate degree this year would have gone through five Grama Sevas, which adds up in all to about fifty days of intense service in the villages? Which university in India can claim to have given such training? It is not just discipline and honesty in the work place that makes them unique. Do you know how intensely our old boys and girls are involved in Seva after they leave? They are doing Seva all the time, all over the world, quietly and without any fuss. For example, a few months ago, during December, when it was getting chilly at nights, our old boys who had gathered here for Bhagavan’s Darshan spontaneously went out at night to the neighbouring town of Penukonda and covered as many street sleepers as possible with blankets. I ask you: How many alumni of the big universities across the globe would do that? Think about that. In the ultimate analysis, mankind, if it really wants to get out of the present mess, which, by the way, is caused almost entirely by mass selfishness and greed, can do so only when individuals develop strong character. For that to happen on a large scale, the world needs hundreds if not thousands of universities like Swami’s Institute. And when students in large number receive what I would call true education for life, then in later life they would automatically act in the spirit of Trusteeship. When that happens, most of man-made problems would disappear and the world would become a much better and holier place to live in. I maintain that without character, one simply cannot expect any major improvement in Society. Character is moulded in the home and in the educational institutions. Where education is concerned, Swami’s Institute is the best example in the whole world. When thousands and thousands of young men and women go out into Society with strong character, they would for sure lead a Dharmic life. True Dharmic life calls for selflessness, and actions performed in the spirit of trusteeship. If people in all walks of life and even organisations follow that principle, then the Golden Age that we all dream about HAS to dawn. People may shrug their shoulders and dismiss all this as a wild pipe dream. It cannot happen, they might say. My answer is: It WILL happen if we want it to. If you tell an educator who does not know anything about Baba to set up a University like Swami’s he will say it is not possible. But Swami has done it. Others can do it too but only if they really want to. So the question boils down to: Are we really serious about changing this world or we want someone else to do it for us? If the latter is the case, we can be sure that nothing would ever happen. If a person is hungry, then that person has to eat; someone else cannot eat for that person. It is as simple as that!